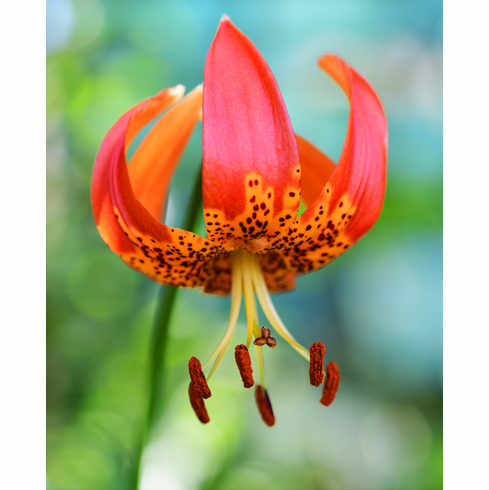 Grown by Pontus Wallsten, he reports this bulb was received in a trade with a member of the RHS and was originally planted as seed of Lilium Kelleyanum which is obliviously turned out not to be. Lilium Kelleyanum and Lilium pardalinum territories in nature do overlap in some areas and this might have been wild collected seed based on the photo insert of this same coloration being found in nature in a natural stand of Lilium pardalinum . Photo insert of 'L. pardalinum Apricot Giant' type found in Tuolumne County, California. Photo copyright Barry Breckling. Source CalPhotos. Original photo cropped. This image has a Creative Commons Attribution-NonCommercial-ShareAlike 3.0 (CC BY-NC-SA 3.0) license.